Bacteria are single-celled organisms that can be found in multiple environments. In order to study the characteristics of bacteria, biologists grow them in the laboratory under controlled conditions. In order to do this, the bacteria have to be placed into a medium that provides them with the optimum growth conditions. Nutrient agar is one of the most common growth mediums and consists of a variety of different chemicals. A large proportion of nutrient agar consists of the chemical agar. Agar is a gelatinous mixture that is extracted from seaweed. When mixed with water, a 1.5 percent agar solution forms a gel when cooled to below 45 degrees Celsius (113 degrees Fahrenheit). Agar consists of a mixture of sugar polymers (polysaccharides), where the basic sugar is galactose. Peptone is a mixture of proteins and amino acids that is obtained by breaking down natural products such as animal tissues, milk and plants. The function of peptone in nutrient agar is to provide a protein source so that micro-organisms can grow. Sodium chloride is the most well-known salt and consists of a single sodium ion that is bonded to a single chlorine ion. The presence of sodium chloride in nutrient agar maintains a salt concentration in the medium that is similar to the cytoplasm of the microorganisms. If the salt concentration is not similar, osmosis takes place transporting excess water into or out from the cell. Both of these scenarios can be lead to the death of the cell. Water makes up a large proportion of nutrient agar, with 1 liter being added for every 15 grams (0.5 Ounce) of agar. Water is essential for the growth of and reproduction of micro-organisms and also provides the medium through which various nutrients can be transported. What Products Are Made From Seaweed? What Organelles Are in a Prokaryotic Cell? Markings, Samuel. "The Chemical Composition of Nutrient Agar." 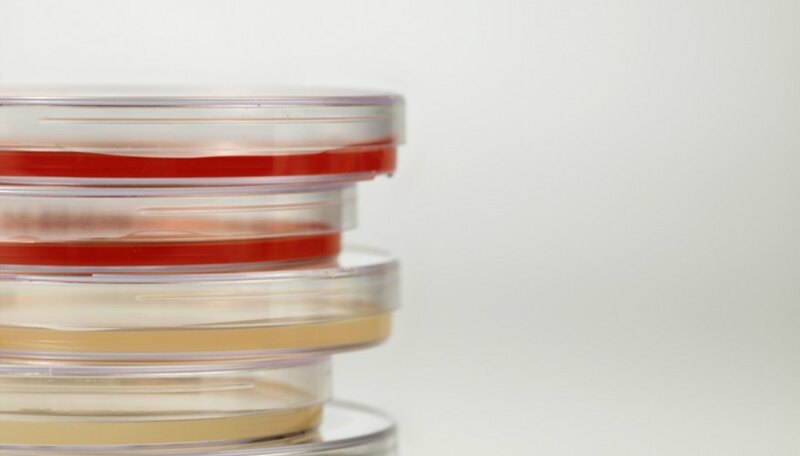 Sciencing, https://sciencing.com/chemical-composition-nutrient-agar-14135.html. 13 March 2018.